Talk about the hit anime movie (also known as "Kimi No Na Wa" in Japan) here. Plot Summary: Mitsuha Miyamizu is a high school student in the rural countryside of Japan. Taki Tachibana is a teenager living in Tokyo. As a comet approaches Earth, their dreams and lives start getting entangled. One day Mitsuha wakes up as Taki. Taki one day wakes up as Mitsuha. For a few days they sporadically switch bodies until one afternoon they lose complete contact. ABS-CBN's airing of the Filipino-dubbed version of Makoto Shinkai's your name. (Kimi no Na wa.) anime film during the channel's "Kapamilya Blockbuster Family Weekend" block on Sunday earned a ratings average of 9.2%, and ranked #18 in the ratings on Sunday. The screening was the film's television premiere in the Philippines. ABS-CBN's TAG channel was originally slated to air the Filipino-dubbed version of the film, but the channel recently shut down without airing the film. your name. centers on Taki, a high school boy living in Tokyo who works part-time at a restaurant, and Mitsuha, a high school girl living in a town in rural Japan who wants to live in the city. One day, they begin switching bodies every time they sleep, and have to find a way to communicate with each other to manage each other's lives. Later, when they try to meet up physically for the first time, Taki discovers a secret that will lead to a race against time to try and save each other. The film opened in Japan in August 2016, and has become the fourth highest-grossing film of all time in Japan, the second highest-grossing Japanese film, and the second highest-grossing anime film, with earnings of more than 25 billion yen (about US$225 million). The film opened in 92 countries and territories, and earned box-office achievements in South Korea, China, Hong Kong, Thailand, and Taiwan, in addition to Japan. your name. opened in the Philippines in December 2016. A live-action Hollywood adaptation of the film by Paramount Pictures and J. J. Abrams' Bad Robot Productions is in the works. Eric Heisserer (Arrival, Final Destination 5) is penning the script. Shinkai's top grosser is first anime title available on ABS-CBN's streaming service. Makoto Shinkai’s top-grossing anime movie your name. is now available on iWant TV, the local streaming service of media conglomerate ABS-CBN. The anime movie was added on iWant TV’s library on Monday, which was the day after its television premiere on the terrestrial channel. This is the first time that a Filipino-dubbed anime title is being streamed on the service. The service is streaming the broadcast version of the film, where some scenes were cut due to time constraints. A representative of the network has told Anime Pilipinas that the movie is expected to be available for watching until the end of summer. As of press time, the program now has more than 20,000 views on the website. 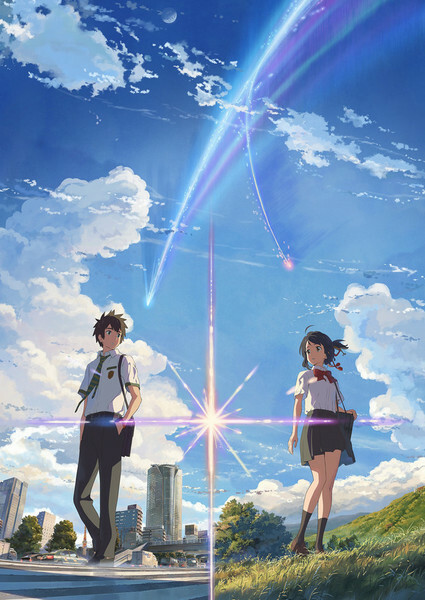 your name., also known by its Japanese title Kimi no Na wa. (君の名は。), is a Japanese animated film written and directed by Makoto Shinkai, who is known for anime films like Voices from a Distant Star, 5 Centimeters Per Second and The Garden of Words. The anime movie is based on the novel with the same name, also written by Shinkai, which was published in Japan by Kadokawa in June of last year. The film was produced by CoMix Wave Films and distributed by TOHO, which premiered in Japanese theaters on August 26, 2016 and ran for 29 weeks. The Filipino voice cast were lead by Leslie Paraboles (“Shimura Shinpachi”, Gintama) as “Taki Tachibana”, and Denise Gail Tumibay (“Yuriko Kogami”, Beautiful Bones: Sakurako’s Investigation) as “Mitsuha Miyamizu”. The anime film, which was distributed by local movie distributor Pioneer Films, was screened in local cinemas in December 14, 2016 and ran for about two weeks before the Metro Manila Film Festival started the same year. The film is now considered as the highest-earning anime film worldwide, beating Studio Ghibli’s Spirited Away, earning US$281 million (about PHP14 billion) in mid-January. According to industry website Box Office Mojo, the film has now earned a total of US$354,425,227 (about PHP18 billion), including the North American screenings. Media conglomerate ABS-CBN announced last year that several Japanese films, including your name., was set to air on TAG movie channel in Filipino dubbing. The planned airing did not come to fruition because the channel has ceased broadcasting on January 15, which was then followed by Filipino language anime channel HEROtv a couple of days later. Your Name movie sa YeY Channel this sunday, August 5. The movie will air again on YeY! 's Kid Sine on January 27, 2019 back-to-back with The Last: Naruto the Movie.